What Does Funding A Trust Actually Mean? 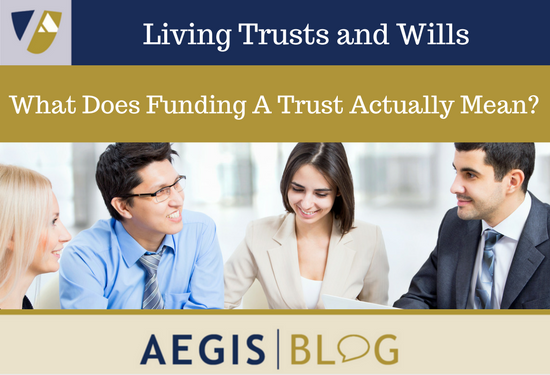 The terminology “funding a trust” relates to the fact that estate planning documents, whether a will or a trust, don’t work like they are supposed to unless a person’s assets are coordinated with those estate planning documents. In the case of a person who has created a trust, which dictates how the assets will be used during the person’s lifetime and who they will pass to at death, the trust won’t properly do all of that unless the assets are titled in the name of the trust. The assets in your trust are controlled by the trustee. The trustee of the trust is the only person who has the authority to exercise any kind of control over the trust assets, whether it’s determining how they are invested and utilized. In the most common type of estate planning trust, which is referred to as a revocable living trust, if you have created the trust, you most likely would have also named yourself as the trustee to keep control of all your assets. Why Is Funding A Trust So Important? The reason that it is so important is that if a trust isn’t properly funded, it won’t work to distribute the assets the way a trustor says it should. A good example would be if the trust designates that all of the assets in my trust are to be distributed to my two children, but if I also have a life insurance policy that was purchased a long time ago, which now has my ex-wife as the beneficiary, the proceeds of the policy are going to be paid to the ex-spouse, not your children in the manner that the trust directs. What Happens If Someone Forgets To Transfer Assets Into The Trust? In the case of a revocable living trust, which is the most common type of trust, you also pair it with a will. Even though the trust acts as a substitute for the will at death, because it directs where the assets are to be distributed, your trust will only distribute, at your death, the assets that are in your trust. So, if you forgot to put something in your trust before you die, your will says that if you overlook an asset, it leaves that asset to your trust. So if you forget to transfer an asset into your trust, it eventually gets there, after your death, because of your will. If you are the one who has created the trust, you are also the one who is ultimately responsible for putting your assets or funding your assets into your trust. That being said, if you are working with a good attorney or law firm like ours, we give you the assistance you need in order to transfer all of your assets to your trust because we understand that it’s not something that our clients do every day, but it is something that we do every day, and we’ll assist you in making sure it’s all properly done. Can My Attorney Fund My Trust For Me? Your attorney can do this for you, but for whatever reason, the great majority of attorneys don’t. Instead, they will give you a letter telling you how you should go about funding the trust. But if you are someone who isn’t doing this every day, it’s not at the top of your list to get done. Often it doesn’t get done, or it is done incompletely. How Difficult Is The Process Of Funding A Trust? The process of funding a trust can be tedious, which is one of the reasons that we provide this assistance to our clients. In order to fund the trust, deeds have to be prepared to transfer real estate into the trust. Automobile titles have to be changed in order to make the trust the owner or beneficiary of the vehicles. Bank accounts need to be changed from your individual name to the name of the trust. If you have financial vehicles, like retirement plans or life insurance, the beneficiary needs to be changed and coordinated so that the assets will ultimately go into the trust. For securities or brokerage accounts, the name on the accounts has to be changed. So, it’s not rocket science in order to fund a trust; it’s just a lot of tedious work that has to be done to complete the funding in a proper manner.